Chances are you have never driven, let alone owned an Acura. More importantly for Honda’s luxury brand is that brand recognition is low which results in a lack of knowledge about their vehicles. That’s all about to change because the 2012 Acura TL Advance has all the elements owners of the luxury sport sedan demand and the unique styling to grab their attention. Acura has jumped right into this crowded, coveted and all too often cloned segment with a refreshing offering that should drive traffic to dealer’s showrooms and drive the competition back to the drawing board. After having misplaced, dropped between the seats or forgotten where I put the electronic key fob I’m still sure if I really like just pushing the ignition button to start a vehicle, but doing so brings the TL to life. The car’s dash illuminates while the TL’s 3.5-liter V6 engine gives the low rumblings only a power plant that cranks out 280Hp can produce and very good low end torque gets you off the mark quickly. Whether on a long Sunday drive or just on your daily grind to the office, the TL is a driver’s car that wants to be driven. Wanting to do something and being able to accomplish it is another matter. 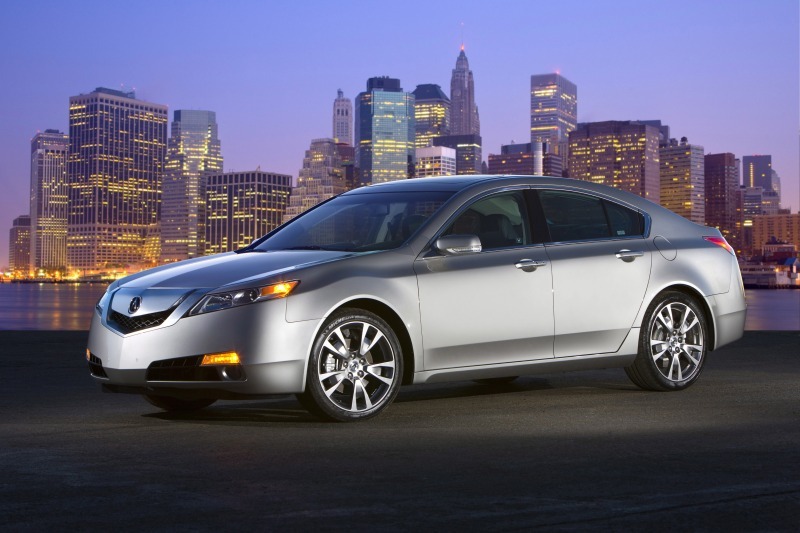 The Acura TL is a dream to drive and has excellent acceleration, handling and braking. The TL’s striking interior features a stepped dash that flows seamlessly into the center console that is not only one of the most attractive designs I have seen but, and more importantly is, one of the most efficient. The center “well” houses two cup holders and it is flanked by a sliding door that reveals the cigarette lighter. Acura’s interior specialists provided additional storage areas below the dash and concealed in the center arm rest. This spacious compartment also houses the vehicle’s data hub with USB, Aux, and 12v outlets. I can’t overstate how efficient, stylish and practical the TL’s interior is and the end result is an unmatched driving environment for you to enjoy while behind the wheel. The information clusters, controls and displays are centered and are easily controlled. I really appreciate that all the controls are located on the dash; this eliminates the need to feel around the center counsel to locate the air conditioning. In fact the gear shift and parking brake are the only “controls” on the center console/arm rest area. More importantly, the TL’s interior lighting scheme was excellent, proving that less is more, by providing the illumination required to easily identify needed information without creating a distraction. The driver has a 10-way power seat to ensure maximum comfort, while the passenger is forced to make do with only an 8-way power seat. The driver and the front seat occupant are protected by both front and side impact airbags, while back seat passengers are shielded on either side by a side curtain airbag. Other safety features include anti-lock brakes, vehicle stability assist and electronic brake distribution to ensure the driver has the ability to maintain control the car under a host of conditions encountered on the road. So before you buy your next “same-old, same-old” car you always have, I recommend you try the Acura TL that’s available for your inspection at your local dealer. The TL Advance I drove had an MSRP of $42,395 nicely equipped and boasts an impressive 20 mph city/29 mph highway fuel economy. Acura finally has a player in the game.